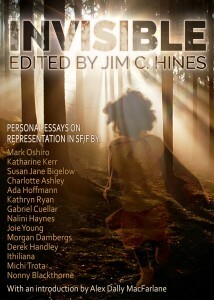 I went to bed before the Hugo Award results were announced, and woke up this morning to emails about INVISIBLE. The Hugo voting statistics were released last night, and it turns out that INVISIBLE would almost certainly have been on the ballot for Best Related Work if not for the Sad and Rabid Puppy slate voting campaigns. Thank you to everyone who nominated us. And thank you to all of the contributors for sharing their stories and helping to create a wonderful, powerful, and potentially award-worthy collection. Shiny rocket trophies are nice, but far more valuable is the fact that we created something important, something that had a real impact and made a difference to people. To Alex Dally MacFarlane, Mark Oshiro, Katharine Kit Kerr, Susan Jane Bigelow, Charlotte Ashley, Ada Hoffman, Kathryn Ryan, Gabriel Feycat Cuellar, Nalini Haynes, Joie Broin, Morgan Dambergs, Derek Handley, Ithiliana, Michi Trota, Nonny Blackthorne, and cover artist Mark Ferrari: Every one of you should be damn proud of yourselves, and I’d like to ask one last thing of you all. Do something nice for yourselves today. Treat yourself to ice cream or go see a movie or just stay home and kiss a loved one. Whatever you like, so long as it’s a way to celebrate and reward yourself for your part in helping to create something good. But that is great advice about celebrating anyway. Also, given your change in status in a week, remind yourself that you are doing good work and turn it around into motivation to keep moving forward. Your best is still ahead. Man, some of the 6th place nominees were great things that I wish I could have voted to give the Hugo to. Unfortunately, I didn’t learn about the awesome deal that is the supporting until after the Puppies did their thing on the nominations. Will definitely be making sure to get my nomination ballot in next year. I suspect a lot of people will be doing the same, which is one of the good things to come out of this year. Honestly, I’m much more upset about Eugie than I am about this. With INVISIBLE, I’m disappointed more for my authors, and I hope they all know they created something special and worthy of recognition. But Eugie and her story…I have no words for that. The Foster (sob) and Vernon works are things I would have been delighted to own and vote for. And of course Invisible. What’s striking is how few votes it takes for something to get nominated, especially in the short fiction and fan related categories. Since I’ll get to nominate next year, what are good sources for short stories/novelettes/novellas? I usually just read novels. 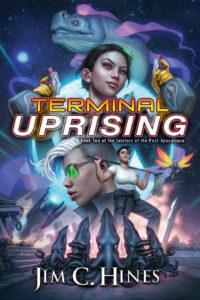 Avilyn: I’ve been enjoying short stories and essays from the following online magazines: Lightspeed Magazine, Fireside, and Uncanny Magazine. There are other, more venerable publications you might look at too, such as Asimov’s Science Fiction and Locus Magazine. Just like puppies to tear something up all over the living room carpet the moment they’re left unsupervised. With proper care and training, they usually grow up into well-socialized adults. Eventually. But…thisclose to a Hugo nomination! Wow! Everyone involved deserves a huge round of applause, and I’m guessing that just being on the list of potential candidates will bring Invisible in front of new eyes who might not have known about it, so that’s a definite win! Well done, one and all! There are a lot of different places. Locus actually has a monthly SFF short-fiction review column that focuses on stuff from various magazines (as opposed to stuff from collections and anthologies and so forth). Nerds of a Feather also does a short-fiction rec post (I think it is a regular feature, but I am not sure). Anyone else know blogs, magazines, or whatever that do a regular short fiction review/recommendation feature? I would be interested in this myself! I personally check Strange Horizons and Lightspeed fairly regularly, since I think they are on a more frequent release schedule than, say, Clarkesworld. (Which is a fine magazine too, on a monthly schedule.) Some other places that have published stories I really liked are Giganotosaurus and Apex. And of course there’s always the path of just following an author you like and perking up when they say “Hey, I have a new piece of short fiction out in ___” — the Ursula Vernon stuff that others have mentioned elsewhere in this comment section was self-published IIRC, and I for one very much liked “Toad Words” (the collection as well as the titular story). Thanks for all of the short fiction suggestions above!